Kino Flo True Match K55 lamps are high output fluorescent lamps thathave been specially formulated for filming and digital imaging.Nominally balanced to photographic daylight colour temperature, K55lamps can be used in natural daylight and with daylight balance fixtures (HMI) withoutfiltration. Please read FAQ for more information. Single pin lamps are referred to as Slimline fluorescent's. Slimlinelamps will not operate on Kino Flo HO ballasts. 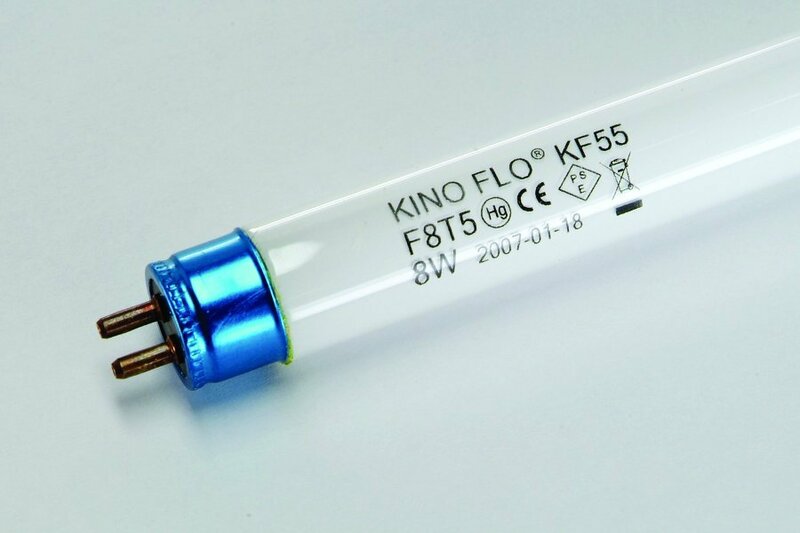 Most double pin(bi-pin) lamps will operate on Kino Flo ballasts. However, Kino Flo HOballasts will shorten the life span of store bought bi-pin lamps. Tip: If a 4ft lamp is operating too hot and the color is shifting green,move the select switch to Std (or 2ft). This will reduce the lampcurrent and drop the green spike. Unfortunately,color meters available to cinematographers are far from beingscientifically accurate when reading fluorescent's. They act as a greatcomparative tool to determine differences between twogivenlight sources but are inadequate in providing definitive data. You willrarely find two color meters, even if they are the same make and model,that provide equal data. Results between meters may be similar but notidentical.